310 pages | 104 B/W Illus. 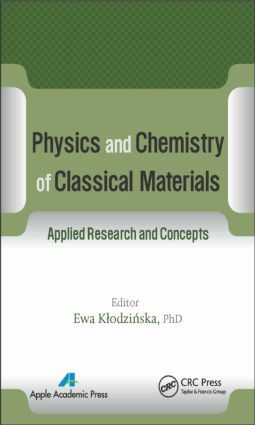 This book provides a comprehensive presentation of the concepts, properties, and applications of classical materials. It also provides the first unified treatment for the broad subject of classical materials. The authors use a fundamental approach to define the structure and properties of a wide range of solids on the basis of the local chemical bonding and atomic order present in the material. Emphasizing the physical and chemical origins of different material properties, this important volume focuses on the most technologically important materials being utilized and developed by scientists and engineers. This book presents peer-reviewed chapters and survey articles on review, research, and development in the fields of classical materials. The wide coverage makes this book an excellent reference book for researchers and graduate students on the subject. The new topics covered in this book will be an excellent resource for industries and academic researchers as well. Ewa Klodzinska, PhD, holds a PhD from Nicolaus Copernicus University, Faculty of Chemistry in Torun, Poland. For ten years, she has been doing research on determination and identification of microorganisms using the electromigration techniques for the purposes of medical diagnosis. Currently she is working at the Institute for Engineering of Polymer Materials and Dyes in Torun, Poland, and investigates surface characteristics of biodegradable polymer material on the basis of zeta potential measurements. She has written several original articles, monographs, and chapters in books for graduate students and scientists. She has made valuable contributions to the theory and practice of electromigration techniques, chromatography, sample preparation, and application of separation science in pharmaceutical and medical analysis. Dr. Ewa Klodzinska is a member of editorial boards of ISRN Analytical Chemistry and the International Journal of Chemoinformatics and Chemical Engineering (IJCCE).